The gethostbyname and gethostbyaddr functions only support IPv4. The API for resolving IPv6 addresses went through several iterations, as will be described in Section 11.20; the final result is the getaddrinfo function. The getaddrinfo function handles both name-to-address and service-to-port translation, and returns sockaddr structures instead of a list of addresses. These sockaddr structures can then be used by the socket functions directly. In this way, the getaddrinfo function hides all the protocol dependencies in the library function, which is where they belong. The application deals only with the socket address structures that are filled in by getaddrinfo. This function is defined in the POSIX specification. The POSIX definition of this function comes from an earlier proposal by Keith Sklower for a function named getconninfo. This function was the result of discussions with Eric Allman, William Durst, Michael Karels, and Steven Wise, and from an early implementation written by Eric Allman. The observation that specifying a hostname and a service name would suffice for connecting to a service independent of protocol details was made by Marshall Rose in a proposal to X/Open. This function returns through the result pointer a pointer to a linked list of addrinfo structures, which is defined by including <netdb.h>. hints is either a null pointer or a pointer to an addrinfo structure that the caller fills in with hints about the types of information the caller wants returned. For example, if the specified service is provided for both TCP and UDP (e.g., the domain service, which refers to a DNS server), the caller can set the ai_socktype member of the hints structure to SOCK_DGRAM. The only information returned will be for datagram sockets. The caller will use the socket for a passive open. Tells the function to return the canonical name of the host. Prevents any kind of name-to-address mapping; the hostname argument must be an address string. Prevents any kind of name-to-service mapping; the service argument must be a decimal port number string. If specified along with an ai_family of AF_INET6, then returns IPv4-mapped IPv6 addresses corresponding to A records if there are no available AAAA records. If specified along with AI_V4MAPPED, then returns IPv4-mapped IPv6 addresses in addition to any AAAA records belonging to the name. Only looks up addresses for a given IP version if there is one or more interface that is not a loopback interface configured with an IP address of that version. If the hints argument is a null pointer, the function assumes a value of 0 for ai_flags, ai_socktype, and ai_protocol, and a value of AF_UNSPEC for ai_family. If there are multiple addresses associated with the hostname, one structure is returned for each address that is usable with the requested address family (the ai_family hint, if specified). We show this example in Figure 11.5. There is no guaranteed order of the structures when multiple items are returned; that is, we cannot assume that TCP services will be returned before UDP services. Figure 11.5. Example of information returned by getaddrinfo. Although not guaranteed, an implementation should return the IP addresses in the same order as they are returned by the DNS. Some resolvers allow the administrator to specify an address sorting order in the /etc/resolv.conf file. IPv6 specifies address selection rules (RFC 3484 [Draves 2003]), which could affect the order of addresses returned by getaddrinfo. The information returned in the addrinfo structures is ready for a call to socket and then either a call to connect or sendto (for a client), or bind (for a server). The arguments to socket are the members ai_family, ai_socktype, and ai_protocol. The second and third arguments to either connect or bind are ai_addr (a pointer to a socket address structure of the appropriate type, filled in by getaddrinfo) and ai_addrlen (the length of this socket address structure). If the AI_CANONNAME flag is set in the hints structure, the ai_canonname member of the first returned structure points to the canonical name of the host. In terms of the DNS, this is normally the FQDN. Programs like telnet commonly use this flag to be able to print the canonical hostname of the system to which they are connecting, so that if the user supplied a shortcut or an alias, he or she knows what got looked up. In this figure, everything except the res variable is dynamically allocated memory (e.g., from malloc). We assume that the canonical name of the host freebsd4 is freebsd4.unpbook.com and that this host has two IPv4 addresses in the DNS. Port 53 is for the domain service. This port number will be in network byte order in the socket address structures. We also show the returned ai_protocol values as IPPROTO_TCP or IPPROTO_UDP. It would also be acceptable for getaddrinfo to return an ai_protocol of 0 for the two SOCK_STREAM structures if that is sufficient to specify TCP (it is not sufficient if the system implements SCTP, for example), and an ai_protocol of 0 for the two SOCK_DGRAM structures if the system doesn't implement any other SOCK_DGRAM protocols for IP (as of this writing, none are yet standardized, but two are in development in the IETF). It is safest for getaddrinfo to always return the specific protocol. 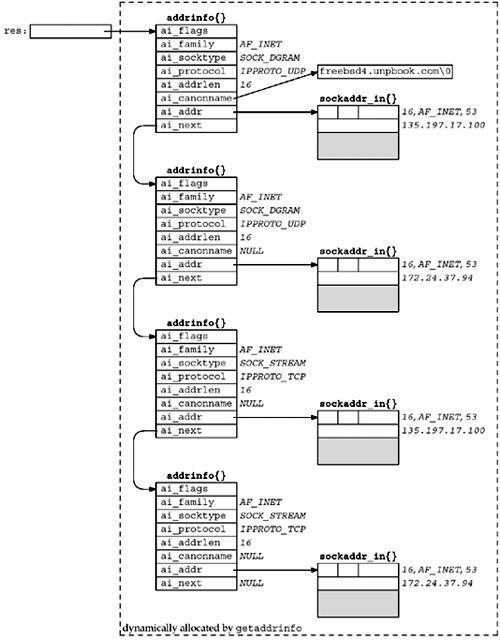 Figure 11.6 summarizes the number of addrinfo structures returned for each address that is being returned, based on the specified service name (which can be a decimal port number) and any ai_socktype hint. Figure 11.6. Number of addrinfo structures returned per IP address. Multiple addrinfo structures are returned for each IP address only when no ai_socktype hint is provided and the service name is supported by multiple transport protocols (as indicated in the /etc/services file). If we were to enumerate all 64 possible inputs to getaddrinfo (there are six input variables), many would be invalid and some would make little sense. Instead, we will look at the common cases. Specify the hostname and service. This is normal for a TCP or UDP client. On return, a TCP client loops through all returned IP addresses, calling socket and connect for each one, until the connection succeeds or until all addresses have been tried. We will show an example of this with our tcp_connect function in Figure 11.10. For a UDP client, the socket address structure filled in by getaddrinfo would be used in a call to sendto or connect. If the client can tell that the first address doesn't appear to work (either by receiving an error on a connected UDP socket or by experiencing a timeout on an unconnected socket), additional addresses can be tried. If the client knows it handles only one type of socket (e.g., Telnet and FTP clients handle only TCP; TFTP clients handle only UDP), then the ai_socktype member of the hints structure should be specified as either SOCK_STREAM or SOCK_DGRAM. A typical server specifies the service but not the hostname, and specifies the AI_PASSIVE flag in the hints structure. The socket address structures returned should contain an IP address of INADDR_ANY (for IPv4) or IN6ADDR_ANY_INIT (for IPv6). A TCP server then calls socket, bind, and listen. If the server wants to malloc another socket address structure to obtain the client's address from accept, the returned ai_addrlen value specifies this size. A UDP server would call socket, bind, and then recvfrom. If the server wants to malloc another socket address structure to obtain the client's address from recvfrom, the returned ai_addrlen value specifies this size. As with the typical client code, if the server knows it only handles one type of socket, the ai_socktype member of the hints structure should be set to either SOCK_STREAM or SOCK_DGRAM. This avoids having multiple structures returned, possibly with the wrong ai_socktype value. The TCP servers that we have shown so far create one listening socket, and the UDP servers create one datagram socket. That is what we assume in the previous item. An alternate server design is for the server to handle multiple sockets using select or poll. In this scenario, the server would go through the entire list of structures returned by getaddrinfo, create one socket per structure, and use select or poll. The problem with this technique is that one reason for getaddrinfo returning multiple structures is when a service can be handled by IPv4 and IPv6 (Figure 11.8). But, these two protocols are not completely independent, as we will see in Section 12.2. That is, if we create a listening IPv6 socket for a given port, there is no need to also create a listening IPv4 socket for that same port, because connections arriving from IPv4 clients are automatically handled by the protocol stack and by the IPv6 listening socket, assuming that the IPV6_V6ONLY socket option is not set. Despite the fact that getaddrinfo is "better" than the gethostbyname and getservbyname functions (it makes it easier to write protocol-independent code; one function handles both the hostname and the service; and all the returned information is dynamically allocated, not statically allocated), it is still not as easy to use as it could be. The problem is that we must allocate a hints structure, initialize it to 0, fill in the desired fields, call getaddrinfo, and then traverse a linked list trying each one. In the next sections, we will provide some simpler interfaces for the typical TCP and UDP clients and servers that we will write in the remainder of this text. getaddrinfo solves the problem of converting hostnames and service names into socket address structures. In Section 11.17, we will describe the reverse function, get nameinfo, which converts socket address structures into hostnames and service names.